"He's been a very, very nice surprise. He makes us faster and for a small man, he does not get knocked off pucks. He's willing to take a hit. That skating ability is something we need." McCarthy was placed on waivers and, should he clear them, will be back in Worcester to begin the season. Former BU captain Nick Bonino is expected to shoulder a larger role this season for the Ducks. Coach Bruce Boudreau has him centering Anaheim’s second line for winger Teemu Selanne. Former Terriers Ben Rosen and Sean Escobedo, who signed contracts in MMMM with the AHL Bridgeport Sound Tigers, have been assigned to the Islanders’ ECHL affiliate the Stockton Thunder. The Connecticut Post spoke with Rosen about his summer experience as a silver medalist at the Maccabiah Games. Ryan Whitney, a free agent this summer after three-and-a-half seasons in Edmonton, has signed a one-year deal with Florida for $900,000. An injury kept 2014 recruit Johnathan MacLeod from participating in last Thursday’s All American Prospect Game in Pittsburgh, but the hard-hitting blueliner was back in the NTDP U18 lineup on Sunday, scoring a power play goal and adding an assist for his first points of the season in three starts, as the U18s routed Chicago, 8-0. MacLeod, who earned third-star honors, played at Kimball Union, teaming with current BU freshmen Doyle Somerby and Nick Roberto two seasons ago before joining the NTDP program. 2016 recruit Clayton Keller scored twice and added an assist to help Shattuck St. Mary's Prep thump Team Southwest, 8-3. The Terriers, who will play an exhibition game against St. Francis Xavier next Saturday, are holding a pre-season clinic for players in the eighth grade through high school at Agganis Arena. 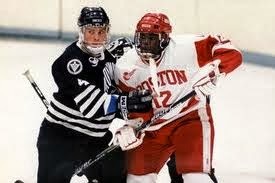 Associate head coach Steve Greeley, director of hockey operations Pertti Hasanen and former BU All American and NHL standout Mike Grier (photo) will lead the clinic, which begins Oct. 7. Details. ► The 2013-14 BU Hockey Prospectus, featuring a schedule, roster, team preview, player thumbnails and more, is now posted in the sidebar in the links section. In Thursday nights’ 5-1 exhibition game win against Colorado, Chiasson scored twice including a power play goal. 2014 forward J.J. Piccinich scored a power play goal and added an assist for Youngstown in the Phantoms’ 4-3 OT loss to Green Bay last night. The 6-0 right wing has scored in each of the Phantoms’ three games and co-leads the team in scoring with five points. Sophomore Dakota Woodworth’s goal 1:15 into overtime—her second score of the game—gave the Terriers a 4-3 win over Western Ontario in an exhibition game last night at Walter Brown Arena. The teams went into the third period tied at a goal apiece and both teams scored twice late in the period. Both BU games were tallied by freshman Maddie Elia. Senior Kerrin Sperry and freshman Victoria Hanson split the netminding duties. Tuesday was Media Day for Hockey East and the Terriers were ranked sixth in the Hockey East Coaches Pre-season poll announced today, the conference’s media day. Lowell and BC each had 104 points, but the River Hawks garnered seven first-place votes to the Eagles four. ● Daily Free Press interviews with Quinn, Noonan and senior defenseman Patrick MacGregor. BU is one of six Hockey East schools that will participate in the inaugural Big Ten/Hockey East Challenge. Five of six teams in the newly formed Big Ten Conference provide the opposition in 13 games to be played between Oct. 18 and 27. The Terriers will appear in three games: Oct. 19, hosting Wisconsin, Oct. 25 at Michigan and Oct 26 at Michigan State. Two future Terriers, rugged defenseman Johnathan MacLeod (2014) and forward Bobo Carpenter (2015) were named to NHL Central Scouting’s preliminary Ones to Watch List for the 2014 draft. MacLeod, who skates for the NTDP U18s, was on the roster for USA Hockey’s All American Prospects Game scheduled for this Thursday, but isn’t available due to an injury. Carpenter, who will return to Austin Prep for his junior year, is currently skating for the Islanders Hockey Club 18U Midgets with a 2-2-4 scoring line in two games. Examing potential candidates for next spring’s NTDP Tryout Camp, the Western Hockey Blog rated 2016 recruit Clayton Keller as a likely invitee. "Clayton Keller-F-Shattuck-St. Mary's (Boston University commit)-Keller made his debut with Shattuck's top team this weekend and looked exceptional. Not very big, but continues to draw comparisons to Zach Parise, for his natural scoring ability, combined with his ability to play in the defensive zone as well." The defending Hockey East champion and national finalist Terriers held their first practice on Monday at Walter Brown Arena. Coach Brian Durocher’s squad, which returns 18 letterwinners, will play an exhibition game this Friday, hosting Western Ontario at 7 p.m.
Alex Chiasson , who appears to have secured a spot on Dallas’ second line, scored a power play goal in last night’s 3-2 OT loss to the Blues. 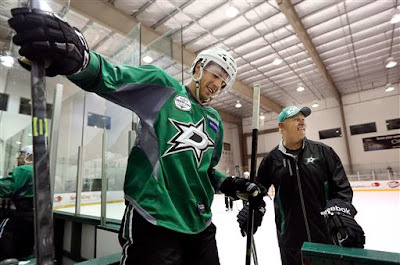 Earlier in the week he scored the shootout game-winner for Dallas in a 3-2 win against Florida. Matt Nieto, who signed with San Jose at the end of last season, is in the mix to make the Sharks’ roster and has seen action in San Jose exhibition games. 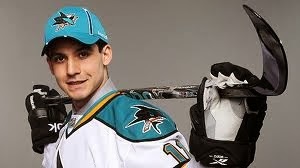 He and Sharks’ coach Todd McLellan talked to the Mercury News about his chance to stay with the big club. Eric Gryba, who was an injury call-up to Ottawa last season and stayed in the lineup throughout the playoffs, talked with his hometown paper, the Saskatoon Star Phoenix, about training camp and his hopes to remain with the organization’s top level team. Former BU All-American Colin Wilson, recovered from off-season shoulder surgery, could see action at wing as well as center this season according to Predators’ coach Barry Trotz. Wilson had a 7-12-19 line in 24 games in an injury shorted season. Bay State Road Sports posted a video of ex-BU All American Colby Cohen firing a shootout goal for Porin Assat in the Finnish SM-Liga. 2014 recruit JJ Piccinich scored goals in each of Youngstown’s first two regular-season games, a 9-3 loss to the NTDP U18s and a 7-6 loss to the NTDP U17s. Fellow 2014 recruit Jack Eichel scored a goal and added two helpers for the U18s’ win. 2016 recruit Clayton Keller has made the prep team roster at Midwest powerhouse Shattuck St. Mary’s, one of only two 10th graders on SSM’s top-level squad. The other is Minnesota 2016 recruit Ryan Lindgren. SSM prep began its Upper Midwest High School Elite League season this weekend. Keller scored a goal in first game, a 5-2 SSM win against Team SW, earning kudos for his efforts tweeted by the Western Hockey Blog’s Chris Dilks. Keller contributed an assist in Saturday’s 6-0 win against Team NW.